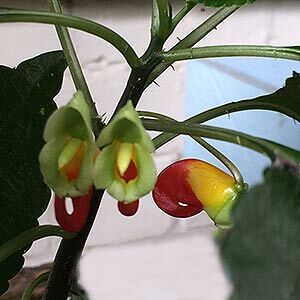 With the common name of ‘Parrot Beak Plant’, Impatiens niamniamensis is an Impatiens with a difference. A small perennial shrub with nothing really outstanding about it, until it flowers. It is in late summer that the small red and yellow flowers appear, and they are fascinating. They appear in clusters and do look like ‘Parrot beaks’. The flowers do tend to be hidden away in the foliage, however they are bright enough to attract attention from most passersby. Usually with the question, What is that plant? Regular pruning will help keep Impatiens niamniamensis as a bushy plant. Use the pruned sections for cuttings, they will strike in water and can then be transferred into a free draining potting soil. Best grown on a warm patio or in a sheltered position with strong filtered light. Hot direct sun will cause foliage to wilt quickly. Position- Filtered shade, however strong light. Flowering will be less in very deep shade. Warmth – This is a planet that requires warmth, outdoors is OK, especially from spring to autumn, however in cold climates it will need to be over wintered indoors. Soil – Well drained but moist is essential. Humus rich for best results and growth. Foliage – Good deep green . Fertiliser – Use a liquid seaweed fertiliser every few weeks from spring to mid summer. Not readily available for sale in Australia.